My name is Tim Turner. I live in South-West London. First Time I Met The Blues is the story of Trevor, Steve and Des, three teenagers growing up in Watford in the mid-60s who form a blues band. The novel follows the career of the band and examines the question of how long you should keep following a dream of stardom – and what happens if you let it go. I used to go to a lot of gigs in pubs where you’d find a bunch of middle-aged blokes playing classic Chicago blues, and I always used to wonder what their story was. Were they ever famous? Had they been playing this music ever since they were young? Years later, the idea of finding out by inventing my own band and writing their story coalesced into a plan for a novel. 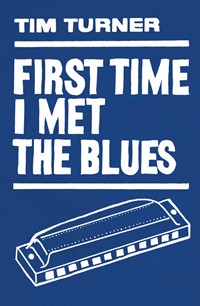 To read more about the ideas and memories that fed into the writing of First Time I Met The Blues, check out my blog about the book. What’s so special about the blues? You’ll have to read the book to find my answer to that question. But if you’d like to explore the blues for yourself in the meantime, I’ve provided some suggestions on the Links page. Is First Time I Met The Blues your first novel? No its my second. The first, Grown-Up People, was published in 2002. It’s a sequel (in the loosest sense of the term) to Alain-Fournier’s classic novel Le Grand Meaulnes, and tells what happens when the descendants of that story’s central characters meet by chance in modern London. You can read more about it on the Books page. Since completing First Time I Met The Blues I’ve written a short novel, The Celebrity Next Door, about the effects on the inhabitants of a quiet suburban close when a professional footballer moves in. I’d like to publish that as well, but for now I’m focusing on getting as wide a readership as I can for First Time I Met The Blues. What do you do when you’re not writing novels? I’m a journalist, working on magazines and websites. If you’re interested in this side of my life, please check out my LinkedIn profile. First Time I Met The Blues.